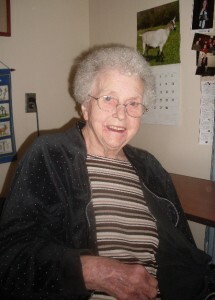 Arlene Peterson Hornstrom, 89, a resident of the Warren Manor Nursing Home died at her residence on Thursday, February 16, 2012 after an extended illness. She was born March 31, 1922 in Warren, PA. to the late Elmer D. and Jennie S. Fredrickson Peterson. Arlene was a Warren area resident her entire life and was a 1940 graduate of Warren High School. She was a member of St. Paul Lutheran Church, the Birthday Club and was an avid baker. Arlene is survived by her two daughters – Julie Husted and husband, John of Buffalo, N.Y., Beth Zdarko of Bakersfield, CA. 1 Brother – Laverne E. Peterson of Indianapolis, Indiana, 8 Grandchildren, and several nieces and nephews. In addition to her parents, she was preceded in death by her husband, John “Victor” Hornstrom whom she married May 14, 1949 in Warren, who died September 7, 1978, 1 Son – John A. Hornstrom who died September 7, 2007, 1 Sister – Helen E. Peterson, 1 Brother – Gilbert D. Peterson. SO SORRY TO HEAR ABOUT YOUR MOTHER. SHE WAS SICK FOR A LONG TIME. I GUESS JUST ABOUT EVERYONE IS GONE FROM THE OLD NEIGHBORHOOD. NANCY HAHN AND I ARE STILL AROUND, BOTH LIVING IN NORTH WARREN. Julie and Beth, I am so sorry to hear about your mother. I have a lot of good menories of your mom and her cookies. My paryers are with you. Although the Miller family is all very sad to learn about your mother, we have many fond memories of her. She made friends with everyone she met and she always brought some sort of treat when she came to visit. These memories go way back but are not forgotten. You are in our thoughts and prayers. Susan Shows Roeder (her cousin, Eleanor’s daughter). Just spoke with my mom who told me about your mom. My first thought after that were all the birthday cards I got – with a quarter and 2 sticks of gum taped inside. What a treat that always was. God be with you all. Prayers. I was saddened to hear of the death of your mom, Aunt Julie. I have quite a few fond memories of Mrs. Hornstrom dating back to my childhood when I was old enough to remember. She always treated me as if I was one of her grand kids. Right up until not all that long ago she was still remembering me on my birthday with a card. Years ago she would always slip $5 in my cards as well. Just a couple months ago in fact I was going through some of my old USMC items in boxes and bags and came across some of the cards she had sent me years ago. It left a big smile on my face as thinking of the good memories. All of you are in our thoughts and prayers during this sad time. About four years ago my son and I were in Warren and visited your mom. She remembered us and asked questions about my family and parents. Your mom’s spirit and good humor must have helped her endure all of the years she was at the Warren Manor. She adapted well to her surroundings and always was a good mixer with people. As a child, I remember well her regular visits to our house on Central Avenue. What a memory! She was a wealth of information to keep my parents updated on church folks, friends, and neighbors. We could always count on her hearty laugh, and years later (even during her visit for my wedding in 1988 in Alabama) she recalled in detail memorable times, such as cookie baking at Christmas. She was truly a favorite personality of mine. I still often refer to Arlene when I’m with Aunt Elaine and the Henrys, remembering some of her reactions to events, and her honesty in expressing herself. That’s why the Miller girls enjoyed her company. I was very sorry to hear of her passing, but am so grateful to have known her during our years in Warren.